You have added Caftan Cute Black and Beige Embroidered Dress into shopping cart. This pretty embroidered black and beige caftan dress is the perfect option to pack on vacation for a chic resort look. The Caftan Cute Black and Beige Embroidered Dress looks great worn casually with flats or dressed up for dinner with wedges or heels. It can also be worn as a cute swimwear cover-up. 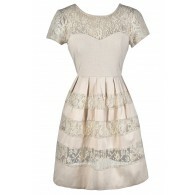 This dress has a surplice crossover neckline trimmed in lace. Black embroidered designs decorate the bodice as well as each sleeve. Each sleeve has a side slit and a slight bell shape, adding to the loose, breezy vibe of this dress. This dress is fully lined below the waist and a hidden back zipper completes this look. The Caftan Cute Black and Beige Embroidered Dress looks great paired with black flat sandals and an oversized bag for a cute resort style. Dress it up with heels or wedges and bold jewelry for an evening look. You'll get lots of wear out of this multi-purpose dress. Details: Lined below the waist. Hidden back zipper. 100% rayon. Lining: 100% polyester. Dry clean only. Small measurements: Length from top of shoulder to hemline: 32". Bust: 34". 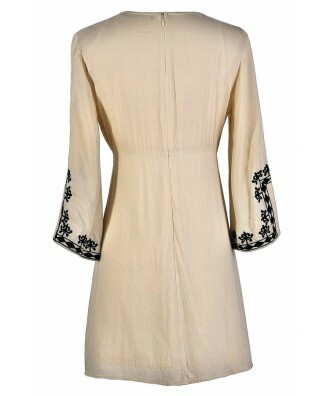 You have added Caftan Cute Black and Beige Embroidered Dress into Wishlist. You have added Caftan Cute Black and Beige Embroidered Dress for Stock Notification. You have set Caftan Cute Black and Beige Embroidered Dress as a loved product. 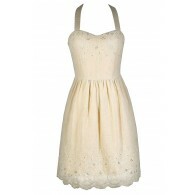 You have removed Caftan Cute Black and Beige Embroidered Dress as a loved product.